Phantom Cardboard: Don't Be Hatin'! 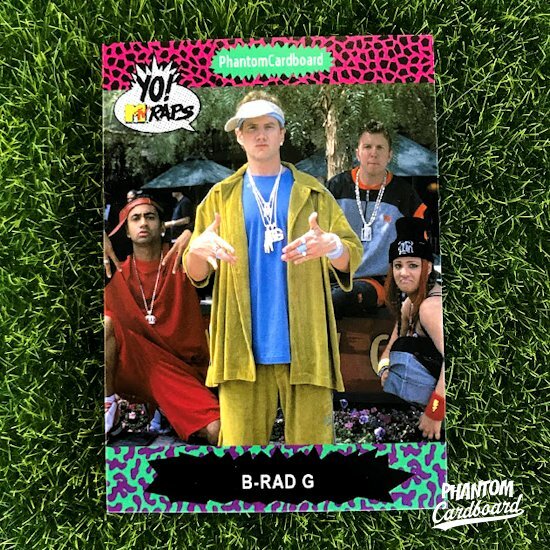 B-Rad is in the heezy to add another custom cardeezy to my 1991 ProSet Yo! MTV Raps inspired seteezy. I'm mean, how could he not be? The dude can rap about anything. Growing up on the mean streets of The 'Bu will sharpen your skills to a lethal measure. Look, I don't know if Malibu's Most Wanted was a critical success but I thought it was funny as hell. If you didn't we'll probably have to fight if we can settle on a meeting place that works for both of us. B-Rad cracks me up going back to the character being a part of The Jamie Kennedy Experiment hidden camera show. That's the kind of stuff that gets me rolling when you put an unsuspecting mark in a crazy outlandish situation and see how they squirm. B-Rad was totally over the top and I loved it.